Step 2a. In Content Station, access the Trash Can application. On the Home page, double-click the Trash Can icon in the Applications pane. Note: If the Trash Can icon is not visible, this means that you don not have enough access rights to use this application. Step 1. 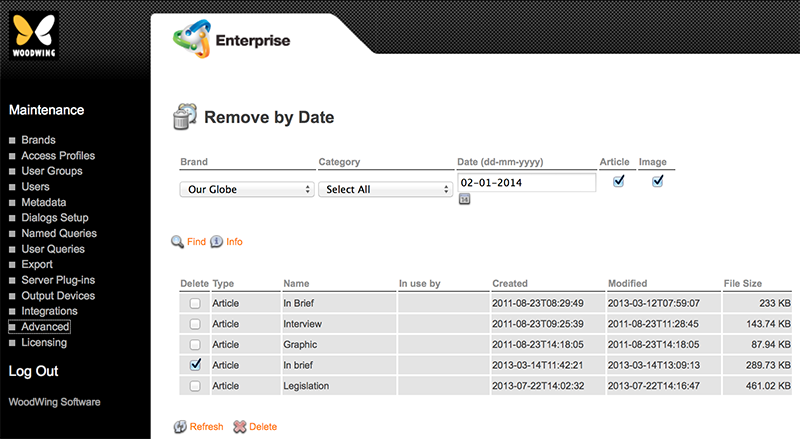 In Enterprise Server, access the Remove by Date Maintenance application. Step 1a. In the Maintenance menu or on the Home page, click Advanced. A page with all advanced Maintenance features appears. Step 1b. Click Remove by Date. The Remove by Date page appears. Step 2. Use the Search options to locate the articles that you want to remove. Step 3. Click Show to see the files that have been found. Step 4. Use the check-boxes in the Delete column to define which articles should be removed.